It has been a week of shoveling and blowing snow as an early Lake Effect Snow event hit central New York this week. 100 hours later, I have four feet (121cm) of the white stuff in my yard. It is no wonder people have been searching and finding my article on Snow Photography from last January. That article will explain why this photo was taken with an Exposure Compensation (EV) of +1.0. Have I mentioned lately how much I like my Nikon D700 SLR Camera? Check out the ISO on this photo. No noise reduction was used. An Irish Pub sign in the middle of a Lake Effect Snow event in Syracuse, New York. Nikon D700/28-300VR, 1/40s, f/5.3, ISO 6400, EV +1.0, 100mm focal length. I am ending 2010 as I started it, waist deep in snow. For the rest of the year, I will be sharing photos of the season on Fridays with a recap on the 31st. I will have more photography tips for you in 2011. I would also like to know if you have any topics or questions you would like to see here. Leave me a comment with your suggestions. 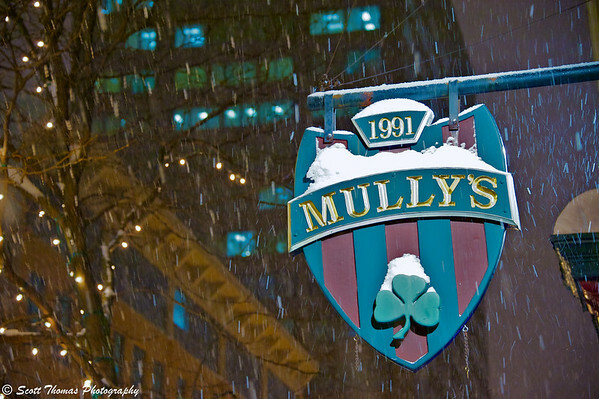 This entry was posted in Photography and tagged armory square, downtown, exposure compensation, irish, mully's, new york, pub, sign, snow, snowing, syracuse. Bookmark the permalink. Merry Christmas to you. I would meet you in there for a Guinness. Then we could discuss ISO6400. Let me tell you the Irish Whiskey they served me warmed me right up! Noticed the ISO did you? This is with NO noise reduction. Not bad, eh? Amazing how you’ve received so much snow and we have not a flake! Lake effect snow can be very localized. 75 miles east or west of us and they have little to no snow on the ground. Dong my best to stay warm. Layers is the key. Hope to get in some calm snow photography this weekend. 4 feet of snow? LUCKY!!!!! I’d be happy with an inch or two! A couple of days ago I saw a preview for the news, where the weather guy said something about a white Christmas. Never did stay up to watch the news to find out what he was talking about. I’m sure he didn’t mean the Dallas area. (Ext. forecast has the highs in the low to mid 50’s). Not many around here think of it as luck. 🙂 It is early this year but nothing we haven’t seen before. If my snowblower breaks down I might take you up on that offer, Michaela! So much snow on your side, Scott ! Ours has been blown away by the wind and rain. The surprise of lightning in December too. Have a Happy Holiday ! Sending many good wishes to you and yours. We didn’t get much wind this time or it would have been called a blizzard. We didn’t get thunder or lightning this time but it has happened before with early snow storms. Four feet is a lot, even by our standards. I hope you are keeping toasty and well-fed, and that you have a very happy holiday season. I am doing all three, Gerry, thank you. Looks like we are in for more snow next week. Does this mean you’ll only be updating on Fridays for the rest of the year? Not that there’s much of the year left! I certainly see how it can be difficult to keep up the blog and the holiday season. I haven’t updated as much as I’d like recently. Holy Moley on the 6400 ISO! NICE! 4 hours east of you we have nothing. I won’t complain, because I’m sure we’ll have some soon enough, but I am looking forward to trying snow/ice pics with the new camera. I’m snow envy here, I hope we have at least a good one this year. Your ISO 6400 image looks amazing, if you didn’t say, it looks just like ISO 100 to me. Happy Holidays to you and your family, Scott! May you thoroughly enjoy them…after you get dug out from your four feet of snow, that is! You have more snow than we do, although the folks in Minnesota might be tied with you. We’ll look forward to more tips in 2011.